Package details This package includes a fixed line, free installation, free wireless router, free basic UK channels, and free calls. Installation details Free installation with a True Fibre Optic link to your premises. Fixed line details No monthly charge, new numbers only. Includes; unlimited national calls to landlines, 90mins to National mobiles, & 200 EU mins to landlines. Up to 10Mb/s ADSL unlimited Internet to your villa or apartment without download restrictions. The package includes our basic UK TV service for 19’95€ +IVA, with a free wireless router and installation. 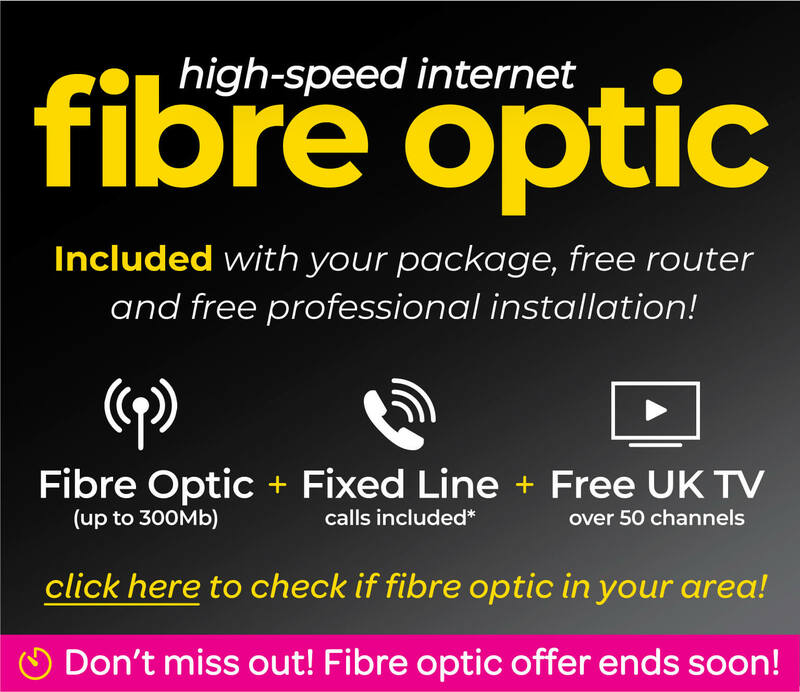 This package includes up to 10Mb/s copper line connection + free basic UK channels with IPTV. Free installation direct to your premises. No fixed line service is included. But we can provide this if you contact our sales team. 12 months from installation date. Unless you are upgrading to Fibre optic. 3G for up to 10Mb/s. ‘Plug + Play’ solution. This package includes FREE IPTV, a fixed line and 400 national calls. This package includes up to 10Mb/s + FREE basic UK channels with IPTV and a fixed line. A “Plug and Play” wireless router, installed by an engineer to get you started right away!